Present: Kellen Brooks, Bill Bryant, Priya Desai, Larry Eberhardt, Misheala Giddings, Sinead Maguina, Bansari Mehta, Akash Patel, Michelle Rodriguez, Floydette Seal, Jo Hill Snyder, Richard White. Guests: Noel Jacobs, Sam West. Opening of Meeting, Introductions & Announcements. Sinead Maguina called the meeting to order at 5:35pm. We convened at the Disciples Center, 301 NW 36th Street. We started with introductions, and Noel Jacobs was welcomed to the meeting. (a) Sinead Maguina made an observation about a women’s conference at the University of Central Oklahoma. Our chapter staffed an outreach table. The keynote speaker was Virginia Gamba, who has served the United Nations as the Director of Disarmament Affairs in the UN Office for Disarmament Affairs. In 2015, she was appointed to a three-member panel to lead the Organisation for the Prohibition of Chemical Weapons-United Nations Joint Investigative Mechanism on the use of chemicals as weapons in Syria. Ms. Gamba was described as warm, genuine. She was recently appointed by United Nations Secretary-General António Guterres as his Special Representative for Children and Armed Conflict. The conference was supported with help from CTAUN, the Committee on Teaching About the United Nations. The theme of the conference was “Empowering Women.” It was sponsored by UCO. (b) International Student Awareness Day will be observed on April 19th at the State Capitol. Sinead announced that she will be able to represent our chapter there from 8 to 10am. Jo Hill Snyder volunteered to help, as well. (c) On April 23rd, there will be a Holocaust Commemoration at Oklahoma City Community College. (d) Hispanic Cultural Day will be celebrated at the State Capitol on May 1st from 12 Noon to 4pm. This is an outreach opportunity for our chapter. Sinead and Michelle (if possible) will represent us. Other volunteers are welcome to help out. (e) On the topic of strategic planning, Priya Desai reported that she is developing some items for future consideration by our leadership team. Our first Young Professionals event will take place on Monday, April 24th. 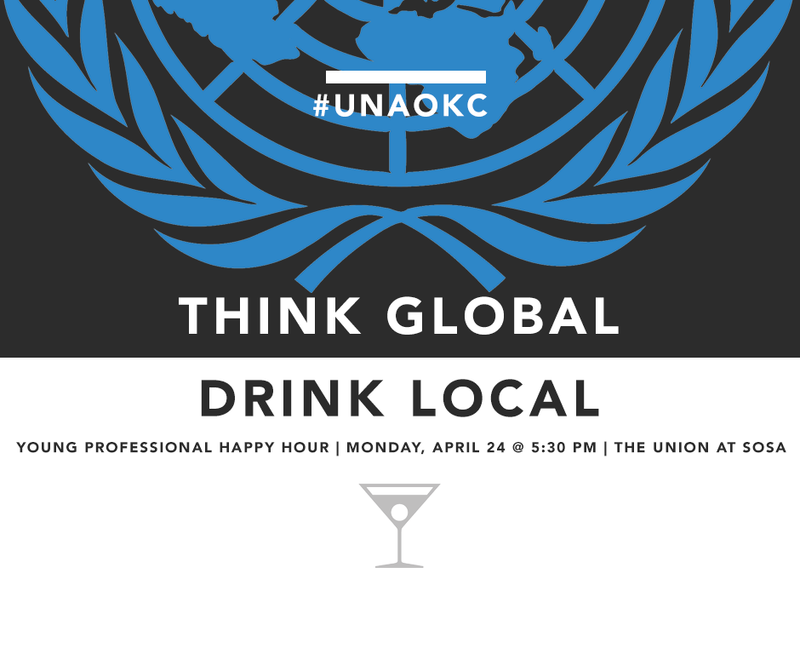 It will be a “Think Global / Drink Local” social hour at The Union at Sosa, 616 NW 5th Street in OKC. The happy hour will focus on the theme of World Immunization Week, which is being observed from April 24th through April 30th. We’ll use the event to highlight the good work of the Shot@Life Campaign. To prepare for the happy hour activities, Misheala Giddings has organized a small planning committee. Michelle will share more information about the National Call-In Day via email. In June, we have been invited to participate in Guyute’s Helping Friendly Tuesday event. Guyute’s is a restaurant at NW 23rd and Shartel. According to the internet, they serve “a gourmet menu from lunch to late night in a laid back atmosphere.” During their Helping Friendly Tuesday events, they offer to donate 10% of sales (excluding tax and tips) to a local non-profit organization. Our date is Tuesday, June 13th. More details will be shared at our next meeting. Another fundraising possibility is offered by CiCi’s Pizza. Michelle is checking out the details. More on programs. Michelle reminded us that Mandela Day will be on July 18th, the anniversary of Nelson Mandela’s birth. We’re planning on a service project. It might be something to support the Boys & Girls Clubs. Or it might support Rebuilding OKC, we don’t know yet. To enhance a sense of comradery, we think t-shirts are called for. Richard White has been our product research guy. There are several online sources that can produce a customized shirt for our chapter. We discussed designs, prices, quantities, etc. Kellen Brooks moved to give a “soft OK” for Richard to move forward with an order; seconded by Bansari Mehta. This motion was approved. Sinead suggested that we should set a dollar limit. A motion was made to authorize an investment of up to $800; seconded by Misheala. Motion approved. Minutes of the March Meeting. Priya moved for approval of the minutes of the March meeting; seconded by Michelle. Motion carried. Michelle moved to receive the Financial Report; seconded by Priya. Motion carried. Membership Development Report. Bansari reported that there was nothing new to share. She has not been receiving any reports from the national office. (4) New Business. Two items were considered in this part of the meeting. A. A Global Citizenship Awards Program. Akash Patel was recognized. He proposed a chapter-sponsored function similar to one that was recently produced by the Eastern Oklahoma chapter. That is, he suggested that we present an Award in Global Citizenship. The award could be given as part of a program – perhaps a gala. Akash offered to convene a planning committee for this purpose. Discussion followed. Someone suggested that the award could be named for Ambassador Edward J. Perkins (US Ambassador to the UN, 1992 – 1993) or Ambassador Jeane Kirkpatrick (US Ambassador to the UN, 1981 – 1985). Both of them served under Republican presidents, and both have a connection to Oklahoma. Kirkpatrick was born in Oklahoma. Perkins was a faculty member at OU. More discussion: Philosophy of ticket pricing; Criteria for honoring someone; A suggestion to hold the event in October – as part of our celebration of UN Day. Sinead suggested that we should authorize Akash to proceed with planning; Richard seconded the motion. The motion was approved. A further recommendation was made – that we should postpone our Public Service Award from June to October. The Public Service award could be given at the same time as the Global Citizenship award. Sinead asked for a vote; seconded by Kellen. Motion carried. B. Malala. It was reported that a coalition of community groups have begun planning an event that will feature Nobel Peace Prize winner Malala Yousafzai if the proper funding can be found. Noel Jacobs reported on the details of the planning. Tentatively, Malala would speak in Oklahoma City. It would be a single appearance. It would take place in August. Malala’s fee is very steep, and there was quite a bit of skepticism as to whether the budget for such an event can be realized. The members of our board expressed a willingness to contribute to this sort of program, but our capacity to contribute is miniscule compared to the funding that is needed. Before we left the subject of “New Business,” Priya announced that she has scheduled a visit to Rep. Tom Cole’s office in Norman. An appointment is set for Thursday, April 27th, at 4pm. We will be advocating for global vaccines on behalf of the Shot@Life campaign. Let Priya know if you would like to participate. (6) Adjournment. With no further business to conduct, the meeting ended at 6:48pm. Our First Young Professional Happy Hour was a Success! Thanks to all who came out to meet other people in the Oklahoma City metro who are interested in a global community—even in a landlocked state in the middle of the country. It was great meeting people from a variety of backgrounds and professions who all had a passion for international issues. We chose to highlight the U.N.’s Shot at Life campaign but were very interested to hear what you were most concerned with, like indigenous peoples’ rights and the protection of religious minorities. If you haven’t yet, make sure you are following us on Twitter and Facebook to hear about more young professional happy hours and other advocacy projects. Let Oklahoma City know that we need the U.N.! We were also proud to debut our new t-shirts! You can buy yours for only $25. They come in crew neck and vee neck, depending on your personal style (we recommend buying both in bulk). We’ll have them available at our next UNAOKC happy hour in May! Check out some of the pictures from yesterday’s event. We hope to see you again at the next one! Present: Kellen Brooks, Bill Bryant, Priya Desai, Sinead Maguina, Bansari Mehta, Nancy Musselman, Michelle Rodriguez, Floydette Seal, Jo Hill Snyder, Richard White. Regrets: Larry Eberhardt, Dee Freeland, Kye LeBoeuf, Firouz Mollaian, Akash Patel, Marina Rodriguez. Sinead Maguina opened the meeting with an observation about the Women’s Day Program on March 4th. She describe an amazing panel and an awesome auction. Our planning team deserves the highest order of congratulations. Also, it was announced that Jerry Stephens has resigned from the board. We thank him for his service to the chapter, and we send him best wishes on his retirement adventures. (2) Program Planning. The discussion turned to Strategic Planning and Committee Updates. It was noted that we need to give greater attention to our advocacy efforts. 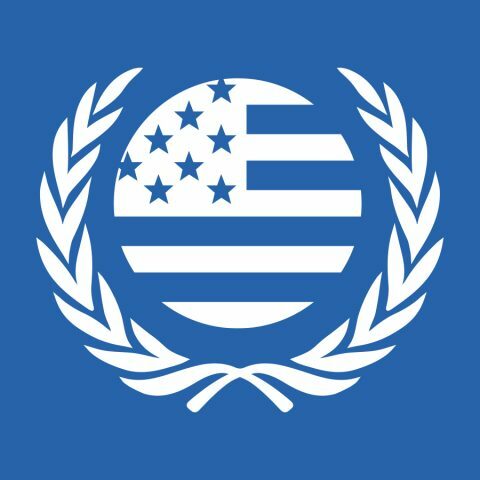 We need to ask our Members of Congress to resist the president’s efforts to cut funding to international organizations like the United Nations. The board considered the planning of future events. Michelle Rodriguez mentioned that we typically organize a service event of some kind for Nelson Mandela Day in July. It was suggested that this year’s project could be something in partnership with “Rebuilding OKC.” There will be more discussion at our meeting in April. Another idea was mentioned. In past years, we have presented a Public Service Award to a public sector worker (government, school, etc.) whose activities coincide in some way with the mission of the United Nations. Past winners have included Oklahomans who work on issues like human trafficking, child labor, soil & water conversation, education, etc. It was suggested that we should revive the award. A presentation could be made in June — the UN Day for Public Service is June 23rd. We agreed to pursue this plan. An online nomination form will be published. More on programs. World Immunization Week begins April 24th. This week is recognized by the World Health Organization. The Shot@Life Campaign is organizing a national call-in for the same week. We should participate. Another idea arose. That is, we should organize a Young Professionals networking event — a happy hour, perhaps, with a speaker. Oklahoma City has a local chapter of the Young Non-profit Professionals Network (YNPN), and they offer an opportunity for us to reach out to young professionals in our sector. We discussed buying a group membership in YNPN. We would need 5 volunteers from our UNA group to participate. They were quickly identified: Richard White, Kellen Brooks, Michelle Rodriguez, Bansari Mehta, and one other. Sinead moved to authorize the expenditure of $125 to sponsor 5 volunteers (named above) to join YNPN, with the expenditure to be reimbursed by each individual — $25 x 5 = $125. A second was offered by Nancy Musselman. Motion carried by consensus. More on programs. Priya reminded us that the International Day of Peace will be on September 21st. Michelle posed a question. She reported that Mandela Day will be on July 18th, the anniversary of his birth. So, if we choose to do a service activity on a Saturday in July, would you prefer July 15th or July 22nd? The discussion evolved. Someone mentioned the possibility of creating a team t-shirt — something to build a team identity and add to our chapter’s visibility in the community. It might be nice to have for our Mandela Day activity, whatever it turns out to be. Richard volunteered to create a design. He mentioned that there are online vendors that can be used to produce the t-shirts. We might even set up an online shop. There was one other topic under the subject of Program Planning. It was noted that our Hideaway Pizza fundraiser was held on Tuesday, March 7th. It was not publicized very well, and only a few people participated. We should try to do another fundraiser of this style. Minutes of the February Meeting. Priya moved for approval of the minutes of the February meeting; seconded by Michelle. Motion carried. Treasurer’s Report. Floydette Seal reported that there were no transactions during the month of February. The balance in the bank is $2,190.64. Bill Bryant moved to receive the Financial Report; seconded by Richard White. Motion carried. Membership Development Report. Bansari reported that there was nothing new to share. Communications Report. Bill reported that the number of “likes” on our Facebook page shot up while we were sharing information about the Women’s Day program. More than 600 people follow our page now, a number that is increasing over time. Public awareness of our chapter grows when we have events to publicize. Bylaws. Sinead directed our attention to a proposed new set of bylaws. The new bylaws are recommended by our national office. The national office intends to enforce minimum standards for all local chapters to follow. Discussion: Approval of the new bylaws by our board of directors will not be the final action on this item. We will also need to present the new bylaws to our chapter members for a vote in a general membership meeting. Kellen moved to approve the new bylaws as presented; seconded by Michelle. VOTE: All Aye. The bylaws were approved. Filling a Vacancy on the Board. Kellen moved to appoint Misheala Giddings to serve as a member of the board of directors. The motion was seconded, and a vote was called. Vote: All Aye; motion carried. It was suggested that Misheala should be appointed to serve as our Young Professionals Chair. Sinead agreed, and so did Misheala. Congratulations, Misheala! Consider Taking Over the Secretary Position. Bill offered to fill the job of Secretary on the condition that someone else would be appointed as Communications Chair. Bill was voted in as Secretary. It was suggested that Richard should be appointed to serve as our Communications Chair. Communications Director. Without objection, Sinead appointed Richard to serve as the Communications Chair, and Richard agreed. Congratulations, Richard! (6) Adjournment. With no further business to conduct, the meeting ended at 6:22pm. Come join your local United Nations Association chapter on Monday, April 24th at 5:30 PM at The Union at Sosa for our first of many young professional events! Each happy hour will briefly have speakers and advocacy actions that relation to a certain international cause. This month’s event will be catered to the UN Foundation campaign “Shot at Life”, since that week is world immunization week! So come out, get a drink, and make some new friends while making a change!